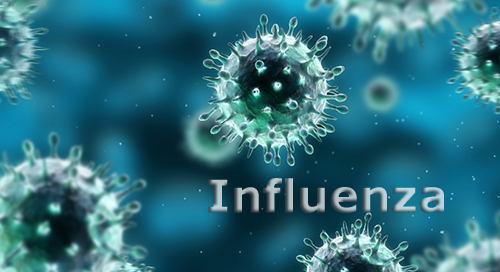 Influenza is a highly contagious respiratory disease of global importance, which causes millions of infections annually with the ever-present risk of a serious outbreak. Passive vaccination is the only method available for partial control of the virus. Rapid diagnosis of influenza has been explored to prevent outbreaks by enabling medication at very early stages of infection; however, diagnostic sensitivity has not been high enough, until now. In a new study published in Scientific Reports, a team of researchers led by Osaka University explored the usefulness of combining a single-particle nanopore sensor with artificial intelligence technology, and found that this approach created a new virus typing method that can be used to identify single influenza virions. Genetic methods can identify many virus species, but require time-intensive processes and specialized staff. Therefore, these methods are unsuitable for point-of-care screening. In a novel approach, the researchers designed a sensor that could assess distinct nanoscale properties of influenza virions within physiological samples. In testing this sensor, the research team found that electroosmotic flow (liquid motion induced by an electric current across the nanopore) through the pore channel could block the passage of non-virus particles. This ensured that the only particles evaluated by the sensor were virus particles, regardless of the complexity of the sample that contained those viruses. In addition to enabling early detection of influenza, this nanosensor method could be modified to enable early detection of other viral particles. This would enable rapid prevention and tracking for a variety of local epidemics and potential pandemics. Rapid diagnosis of flu before symptom onsets can revolutionize our health through diminishing a risk for serious complication as well as preventing infectious disease outbreak. Sensor sensitivity and selectivity are key to accomplish this goal as the number of virus is quite small at the early stage of infection. Here we report on label-free electrical diagnostics of influenza based on nanopore analytics that distinguishes individual virions by their distinct physical features. We accomplish selective resistive-pulse sensing of single flu virus having negative surface charges in a physiological media by exploiting electroosmotic flow to filter contaminants at the Si3N4 pore orifice. We demonstrate identifications of allotypes with 68% accuracy at the single-virus level via pattern classifications of the ionic current signatures. We also show that this discriminability becomes >95% under a binomial distribution theorem by ensembling the pulse data of >20 virions. This simple mechanism is versatile for point-of-care tests of a wide range of flu types.